Parenting is a never-ending process of care, instruction, and supervision – at least for a couple of decades. During the early childhood years, numerous yours are invested, and numerous dollars, to ensure a child’s healthiest possible development. We encourage our patients to include routine dental care into their realm of investments into their families. The value of early childhood dental care is much greater than one may imagine. There comes the point when a child gains understanding about appearance and breath. Poor oral health may become a problem during preschool years or in elementary school. Furthermore, it is important to remember that baby teeth are a primer for adult teeth. They hold space. If they are in poor health, there is a greater risk that permanent teeth will not develop or grow in well. 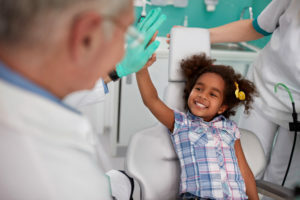 Proper management of baby teeth, coupled with early orthodontic evaluation around age 7, sets a child up for long-term success in the area of confidence in his or her smile. We know that we need our teeth to help us eat. Without them, we could not break apart foods with any density whatsoever. Goodbye, sirloin steak! Farewell, chicken nuggets! During a child’s early years, there is a roadblock to the communication of dental issues. A child may complain that warm or cold foods “hurt.” This is an indication of sensitivity, and sensitivity is a prime warning sign of tooth decay. When teeth are kept in good condition, a child is better able to chew efficiently and without pain. Teeth are also integral to speech development. The tongue and teeth are cohorts in the making of various sounds. For this reason, it is vital that baby teeth are preserved as long as possible. The early loss of baby teeth could spell trouble for clear speech. Research has continually pointed to a connection between a healthy mouth and a healthy body, and vice versa. Children are not immune to the pitfalls of dental decay. Infection in the mouth places unnecessary stress on systemic immunity and paves the way for chronic inflammation during adulthood. We love seeing patients of all ages and helping them enjoy the advantages of good oral health. Call 660-747-9117 to schedule care at Ridgeview Family Dental.